Montage of Jupiter's four Galilean moons, in a composite image depicting part of Jupiter and their relative sizes (positions are illustrative, not actual). From top to bottom: Io, Europa, Ganymede, Callisto. 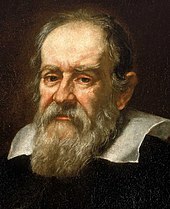 As a result of improvements Galileo Galilei made to the telescope, with a magnifying capability of 20×, he was able to see celestial bodies more distinctly than was ever possible before. This allowed Galilei to observe in either December 1609 or January 1610 what came to be known as the Galilean moons. On January 7, 1610, Galileo wrote a letter containing the first mention of Jupiter's moons. At the time, he saw only three of them, and he believed them to be fixed stars near Jupiter. He continued to observe these celestial orbs from January 8 to March 2, 1610. In these observations, he discovered a fourth body, and also observed that the four were not fixed stars, but rather were orbiting Jupiter. Galileo's discovery proved the importance of the telescope as a tool for astronomers by showing that there were objects in space to be discovered that until then had remained unseen by the naked eye. More importantly, the discovery of celestial bodies orbiting something other than Earth dealt a blow to the then-accepted Ptolemaic world system, which held that Earth was at the center of the universe and all other celestial bodies revolved around it. Galileo's Sidereus Nuncius (Starry Messenger), which announced celestial observations through his telescope, does not explicitly mention Copernican heliocentrism, a theory that placed the Sun at the center of the universe. Nevertheless, Galileo accepted the Copernican theory. A Chinese historian of astronomy, Xi Zezong, has claimed that a "small reddish star" observed near Jupiter in 362 BCE by Chinese astronomer Gan De may have been Ganymede, predating Galileo's discovery by around two millennia. The Medician stars in the Sidereus Nuncius (the 'starry messenger'), 1610. The moons are drawn in changing positions. "God graced me with being able, through such a singular sign, to reveal to my Lord my devotion and the desire I have that his glorious name live as equal among the stars, and since it is up to me, the first discoverer, to name these new planets, I wish, in imitation of the great sages who placed the most excellent heroes of that age among the stars, to inscribe these with the name of the Most Serene Grand Duke." Galileo asked whether he should name the moons the "Cosmian Stars", after Cosimo alone, or the "Medician Stars", which would honor all four brothers in the Medici clan. The secretary replied that the latter name would be best. Scarcely have the immortal graces of your soul begun to shine forth on earth than bright stars offer themselves in the heavens which, like tongues, will speak of and celebrate your most excellent virtues for all time. Behold, therefore, four stars reserved for your illustrious name ... which ... make their journeys and orbits with a marvelous speed around the star of Jupiter ... like children of the same family ... Indeed, it appears the Maker of the Stars himself, by clear arguments, admonished me to call these new planets by the illustrious name of Your Highness before all others. Galileo initially called his discovery the Cosmica Sidera ("Cosimo's stars"), in honour of Cosimo II de' Medici (1590–1621). At Cosimo's suggestion, Galileo changed the name to Medicea Sidera ("the Medician stars"), honouring all four Medici brothers (Cosimo, Francesco, Carlo, and Lorenzo). The discovery was announced in the Sidereus Nuncius ("Starry Messenger"), published in Venice in March 1610, less than two months after the first observations. Gardes, or Satellites (from the Latin satelles, satellitis, meaning "escorts") – by Jacques Ozanam. The names that eventually prevailed were chosen by Simon Marius, who discovered the moons independently at the same time as Galileo: he named them at the suggestion of Johannes Kepler after lovers of the god Zeus (the Greek equivalent of Jupiter): Io, Europa, Ganymede and Callisto, in his Mundus Jovialis, published in 1614. Galileo steadfastly refused to use Marius' names and invented as a result the numbering scheme that is still used nowadays, in parallel with proper moon names. The numbers run from Jupiter outward, thus I, II, III and IV for Io, Europa, Ganymede, and Callisto respectively. Galileo used this system in his notebooks but never actually published it. The numbered names (Jupiter x) were used until the mid-20th century when other inner moons were discovered, and Marius' names became widely used. Galileo was able to develop a method of determining longitude based on the timing of the orbits of the Galilean moons. The times of the eclipses of the moons could be precisely calculated in advance, and compared with local observations on land or on ship to determine the local time and hence longitude. The main problem with the technique was that it was difficult to observe the Galilean moons through a telescope on a moving ship; a problem that Galileo tried to solve with the invention of the celatone. The method was used by Cassini and Picard to re-map France. Io (Jupiter I) is the innermost of the four Galilean moons of Jupiter and, with a diameter of 3642 kilometers, the fourth-largest moon in the Solar System. It was named after Io, a priestess of Hera who became one of the lovers of Zeus. Nevertheless, it was simply referred to as "Jupiter I", or "The first satellite of Jupiter", until the mid-20th century. With over 400 active volcanos, Io is the most geologically active object in the Solar System. Its surface is dotted with more than 100 mountains, some of which are taller than Earth's Mount Everest. 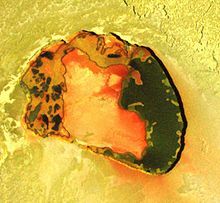 Unlike most satellites in the outer Solar System (which have a thick coating of ice), Io is primarily composed of silicate rock surrounding a molten iron or iron sulfide core. Although not proven, recent data from the Galileo orbiter indicate that Io might have its own magnetic field. Io has an extremely thin atmosphere made up mostly of sulfur dioxide (SO2). If a surface data or collection vessel were to land on Io in the future, it would have to be extremely tough (similar to the tank-like bodies of the Soviet Venera landers) to survive the radiation and magnetic fields that originate from Jupiter. Europa (Jupiter II), the second of the four Galilean moons, is the second closest to Jupiter and the smallest at 3121.6 kilometers in diameter, which is slightly smaller than the Moon. The name comes from a mythical Phoenician noblewoman, Europa, who was courted by Zeus and became the queen of Crete, though the name did not become widely used until the mid-20th century. It has a smooth and bright surface, with a layer of water surrounding the mantle of the planet, thought to be 100 kilometers thick. The smooth surface includes a layer of ice, while the bottom of the ice is theorized to be liquid water. The apparent youth and smoothness of the surface have led to the hypothesis that a water ocean exists beneath it, which could conceivably serve as an abode for extraterrestrial life. Heat energy from tidal flexing ensures that the ocean remains liquid and drives geological activity. Life may exist in Europa's under-ice ocean. So far, there is no evidence that life exists on Europa, but the likely presence of liquid water has spurred calls to send a probe there. Recurring plume erupting from Europa. The prominent markings that criss-cross the moon seem to be mainly albedo features, which emphasize low topography. There are few craters on Europa because its surface is tectonically active and young. Some theories suggest that Jupiter's gravity is causing these markings, as one side of Europa is constantly facing Jupiter. Also, volcanic water eruptions splitting the surface of Europa, and even geysers have been considered as a cause. The color of the markings, reddish-brown, is theorized to be caused by sulfur, but scientists cannot confirm that, because no data collection devices have been sent to Europa. Europa is primarily made of silicate rock and likely has an iron core. It has a tenuous atmosphere composed primarily of oxygen. Ganymede (Jupiter III), the third Galilean moon is named after the mythological Ganymede, cupbearer of the Greek gods and Zeus's beloved. Ganymede is the largest natural satellite in the Solar System at 5262.4 kilometers in diameter, which makes it larger than the planet Mercury – although only at about half of its mass since Ganymede is an icy world. It is the only satellite in the Solar System known to possess a magnetosphere, likely created through convection within the liquid iron core. Ganymede is composed primarily of silicate rock and water ice, and a salt-water ocean is believed to exist nearly 200 km below Ganymede's surface, sandwiched between layers of ice. The metallic core of Ganymede suggests a greater heat at some time in its past than had previously been proposed. The surface is a mix of two types of terrain—highly cratered dark regions and younger, but still ancient, regions with a large array of grooves and ridges. Ganymede has a high number of craters, but many are gone or barely visible due to its icy crust forming over them. The satellite has a thin oxygen atmosphere that includes O, O2, and possibly O3 (ozone), and some atomic hydrogen. Callisto (Jupiter IV) is the fourth and last Galilean moon, and is the second largest of the four, and at 4820.6 kilometers in diameter, it is the third largest moon in the Solar System, and barely smaller than Mercury, though only a third of the latter's mass. It is named after the Greek mythological nymph Callisto, a lover of Zeus who was a daughter of the Arkadian King Lykaon and a hunting companion of the goddess Artemis. The moon does not form part of the orbital resonance that affects three inner Galilean satellites and thus does not experience appreciable tidal heating. Callisto is composed of approximately equal amounts of rock and ices, which makes it the least dense of the Galilean moons. It is one of the most heavily cratered satellites in the Solar System, and one major feature is a basin around 3000 km wide called Valhalla. 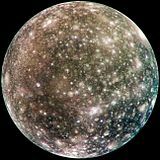 Callisto is surrounded by an extremely thin atmosphere composed of carbon dioxide and probably molecular oxygen. Investigation revealed that Callisto may possibly have a subsurface ocean of liquid water at depths less than 300 kilometres. The likely presence of an ocean within Callisto indicates that it can or could harbour life. However, this is less likely than on nearby Europa. Callisto has long been considered the most suitable place for a human base for future exploration of the Jupiter system since it is furthest from the intense radiation of Jupiter. Fluctuations in the orbits of the moons indicate that their mean density decreases with distance from Jupiter. Callisto, the outermost and least dense of the four, has a density intermediate between ice and rock whereas Io, the innermost and densest moon, has a density intermediate between rock and iron. Callisto has an ancient, heavily cratered and unaltered ice surface and the way it rotates indicates that its density is equally distributed, suggesting that it has no rocky or metallic core but consists of a homogeneous mix of rock and ice. This may well have been the original structure of all the moons. The rotation of the three inner moons, in contrast, indicates differentiation of their interiors with denser matter at the core and lighter matter above. They also reveal significant alteration of the surface. Ganymede reveals past tectonic movement of the ice surface which required partial melting of subsurface layers. Europa reveals more dynamic and recent movement of this nature, suggesting a thinner ice crust. Finally, Io, the innermost moon, has a sulfur surface, active volcanism and no sign of ice. All this evidence suggests that the nearer a moon is to Jupiter the hotter its interior. The current model is that the moons experience tidal heating as a result of the gravitational field of Jupiter in inverse proportion to the square of their distance from the giant planet. In all but Callisto this will have melted the interior ice, allowing rock and iron to sink to the interior and water to cover the surface. In Ganymede a thick and solid ice crust then formed. In warmer Europa a thinner more easily broken crust formed. In Io the heating is so extreme that all the rock has melted and water has long ago boiled out into space. Galilean moons compared with other Solar System bodies, although pixel scale is not accurate at this resolution. Simulations suggest that, while the disk had a relatively high mass at any given moment, over time a substantial fraction (several tenths of a percent) of the mass of Jupiter captured from the Solar nebula was processed through it. However, the disk mass of only 2% that of Jupiter is required to explain the existing satellites. Thus there may have been several generations of Galilean-mass satellites in Jupiter's early history. Each generation of moons would have spiraled into Jupiter, due to drag from the disk, with new moons then forming from the new debris captured from the Solar nebula. By the time the present (possibly fifth) generation formed, the disk had thinned out to the point that it no longer greatly interfered with the moons' orbits. 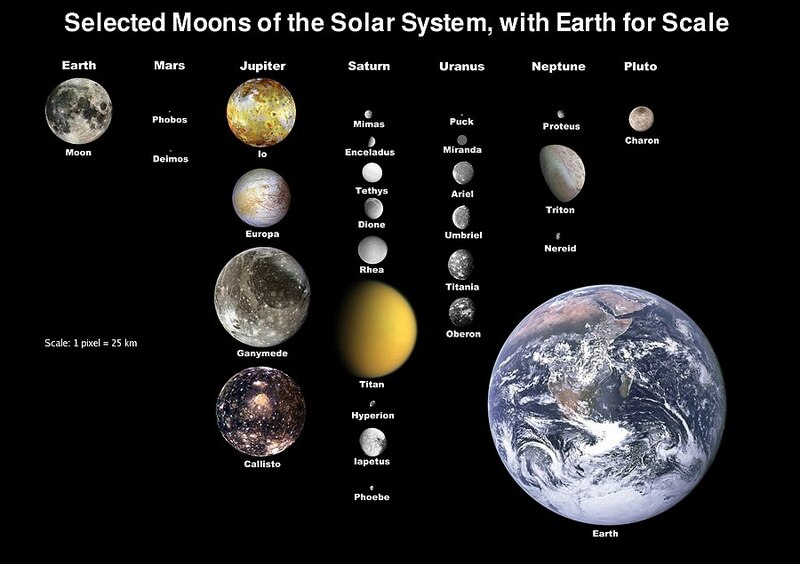 The current Galilean moons were still affected, falling into and being partially protected by an orbital resonance which still exists for Io, Europa, and Ganymede. 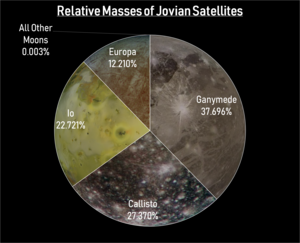 Ganymede's larger mass means that it would have migrated inward at a faster rate than Europa or Io. All four Galilean moons are bright enough to be viewed from Earth without a telescope, if only they could appear farther away from Jupiter. (They are, however, easily distinguished with even low-powered binoculars.) They have apparent magnitudes between 4.6 and 5.6 when Jupiter is in opposition with the Sun, and are about one unit of magnitude dimmer when Jupiter is in conjunction. The main difficulty in observing the moons from Earth is their proximity to Jupiter, since they are obscured by its brightness. The maximum angular separations of the moons are between 2 and 10 arcminutes from Jupiter, which is close to the limit of human visual acuity. Ganymede and Callisto, at their maximum separation, are the likeliest targets for potential naked-eye observation. The three inner Galilean moons revolve in a 1:2:4 resonance. ^ Van Helden, Albert (March 1974). "The Telescope in the Seventeenth Century". Isis. 65 (1): 38–58. doi:10.1086/351216. JSTOR 228880. ^ "Satellites of Jupiter". The Galileo Project. Rice University. 1995. Archived from the original on 4 February 2012. Retrieved 9 August 2007. ^ "Jovilabe". Museo Galileo. Archived from the original on 16 April 2015. Retrieved 15 April 2015. ^ Cosimo is the Italian form of the Greek name Cosmas itself deriving from cosmos (whence the neuter plural adjective cosmica). Sidera is the plural form of the Latin noun sidus "star, constellation". ^ Annuaire de l'Observatoire royal de Bruxelles. L'Académie royale des sciences, des lettres et des beaux-arts de Belgique. 1879. p. 263. ^ a b c d e Marazzini, C. (2005). "The names of the satellites of Jupiter: from Galileo to Simon Marius". Lettere Italiana. 57 (3): 391–407. ^ Howse, Derek. Greenwich Time and the Discovery of the Longitude. Oxford: Oxford University Press, 1980, 12. ^ Howse, Derek (1997). Greenwich Time and the Longitude. Philip Wilson. pp. 26, 31. ^ a b c Canup, Robin M.; Ward, William R. (2008-12-30). Origin of Europa and the Galilean Satellites. University of Arizona Press. p. 59. arXiv:0812.4995. Bibcode:2009euro.book...59C. ISBN 978-0-8165-2844-8. ^ a b c Chown, Marcus (7 March 2009). "Cannibalistic Jupiter ate its early moons". New Scientist. Archived from the original on 23 March 2009. Retrieved 18 March 2009. ^ d'Angelo, Gennaro; Podolak, Morris (2015). "Capture and Evolution of Planetesimals in Circumjovian Disks". The Astrophysical Journal. 806 (2): 203. arXiv:1504.04364. Bibcode:2015ApJ...806..203D. doi:10.1088/0004-637X/806/2/203. ^ Computed from IAG Travaux 2001 Archived 2011-08-10 at WebCite. ^ Lopes, Rosaly M.C; Kamp, Lucas W; Smythe, William D; Mouginis-Mark, Peter; Kargel, Jeff; Radebaugh, Jani; Turtle, Elizabeth P; Perry, Jason; Williams, David A; Carlson, R.W; Douté, S.; the Galileo NIMS; SSI Teams (2004). "Lava lakes on Io: Observations of Io's volcanic activity from Galileo NIMS during the 2001 fly-bys". Icarus. 169 (1): 140–74. Bibcode:2004Icar..169..140L. doi:10.1016/j.icarus.2003.11.013. ^ Schenk, Paul; Hargitai, Henrik; Wilson, Ronda; McEwen, Alfred; Thomas, Peter (2001). "The mountains of Io: Global and geological perspectives from Voyager and Galileo". Journal of Geophysical Research: Planets. 106 (E12): 33201–22. Bibcode:2001JGR...10633201S. doi:10.1029/2000JE001408. ^ Porco, C. C.; West, Robert A.; McEwen, Alfred; Del Genio, Anthony D.; Ingersoll, Andrew P.; Thomas, Peter; Squyres, Steve; Dones, Luke; Murray, Carl D.; Johnson, Torrence V.; Burns, Joseph A.; Brahic, Andre; Neukum, Gerhard; Veverka, Joseph; Barbara, John M.; Denk, Tilmann; Evans, Michael; Ferrier, Joseph J.; Geissler, Paul; Helfenstein, Paul; Roatsch, Thomas; Throop, Henry; Tiscareno, Matthew; Vasavada, Ashwin R. (2003). "Cassini Imaging of Jupiter's Atmosphere, Satellites, and Rings" (PDF). Science. 299 (5612): 1541–7. Bibcode:2003Sci...299.1541P. doi:10.1126/science.1079462. PMID 12624258. Archived (PDF) from the original on 2017-09-22. ^ McEwen, A. S.; Keszthelyi, L.; Spencer, J. R.; Schubert, G.; Matson, D. L.; Lopes-Gautier, R.; Klaasen, K. P.; Johnson, T. V.; Head, J. W.; Geissler, P.; Fagents, S.; Davies, A. G.; Carr, M. H.; Breneman, H. H.; Belton, M. J. S. (1998). "High-Temperature Silicate Volcanism on Jupiter's Moon Io". Science. 281 (5373): 87–90. Bibcode:1998Sci...281...87M. doi:10.1126/science.281.5373.87. PMID 9651251. ^ Fanale, F. P.; Johnson, T. V.; Matson, D. L. (1974). "Io: A Surface Evaporite Deposit?". Science. 186 (4167): 922–5. Bibcode:1974Sci...186..922F. doi:10.1126/science.186.4167.922. PMID 17730914. ^ Hefler, Michael (2001). "Europa: In Depth". NASA, Solar system Exploration. NASA, Jet Propulsion Laboratory. Archived from the original on 14 November 2015. Retrieved 9 August 2007. ^ Hamilton, C. J. "Jupiter's Moon Europa". Archived from the original on 2012-01-24. ^ "Tidal Heating". geology.asu.edu. Archived from the original on 2006-03-29. Retrieved 2007-10-20. ^ Phillips, Cynthia (28 September 2006). "Time for Europa". Space.com. Archived from the original on 24 January 2012. Retrieved 5 January 2014. ^ "Hubble sees recurring plume erupting from Europa". www.spacetelescope.org. Archived from the original on 25 April 2017. Retrieved 24 April 2017. ^ Greenberg, Richard; Geissler, Paul; Hoppa, Gregory; Tufts, B.Randall; Durda, Daniel D.; Pappalardo, Robert; Head, James W.; Greeley, Ronald; Sullivan, Robert; Carr, Michael H. (1998). "Tectonic Processes on Europa: Tidal Stresses, Mechanical Response, and Visible Features". Icarus. 135 (1): 64–78. Bibcode:1998Icar..135...64G. doi:10.1006/icar.1998.5986. ^ Carlson, R.W. ; M.S. Anderson (2005). "Distribution of hydrate on Europa: Further evidence for sulfuric acid hydrate". Icarus. 177 (2): 461–471. Bibcode:2005Icar..177..461C. doi:10.1016/j.icarus.2005.03.026. ^ "Satellites of Jupiter". The Galileo Project. Archived from the original on 2012-02-04. Retrieved 2007-11-24. ^ "Ganymede". nineplanets.org. October 31, 1997. Archived from the original on February 4, 2012. Retrieved 2008-02-27. ^ Kivelson, M.G. ; Khurana, K.K. ; Volwerk, M. (2002). "The Permanent and Inductive Magnetic Moments of Ganymede". Icarus. 157 (2): 507–22. Bibcode:2002Icar..157..507K. doi:10.1006/icar.2002.6834. ^ "Solar System's largest moon likely has a hidden ocean". Jet Propulsion Laboratory. NASA. 2000-12-16. Archived from the original on 2012-02-04. Retrieved 2008-01-11. ^ Hall, D. T.; Feldman, P. D.; McGrath, M. A.; Strobel, D. F. (1998). "The Far‐Ultraviolet Oxygen Airglow of Europa and Ganymede". The Astrophysical Journal. 499 (1): 475–481. Bibcode:1998ApJ...499..475H. doi:10.1086/305604. ^ Eviatar, Aharon; m. Vasyliūnas, Vytenis; a. Gurnett, Donald (2001). "The ionosphere of Ganymede". Planetary and Space Science. 49 (3–4): 327–36. Bibcode:2001P&SS...49..327E. doi:10.1016/S0032-0633(00)00154-9. ^ Musotto, S; Varadi, Ferenc; Moore, William; Schubert, Gerald (2002). "Numerical Simulations of the Orbits of the Galilean Satellites". Icarus. 159 (2): 500–4. Bibcode:2002Icar..159..500M. doi:10.1006/icar.2002.6939. ^ Carlson, R. W. (1999). "A Tenuous Carbon Dioxide Atmosphere on Jupiter's Moon Callisto" (PDF). Science. 283 (5403): 820–1. Bibcode:1999Sci...283..820C. CiteSeerX 10.1.1.620.9273. doi:10.1126/science.283.5403.820. hdl:2014/16785. PMID 9933159. Archived (PDF) from the original on 2008-10-03. ^ Liang, Mao-Chang; Lane, Benjamin F.; Pappalardo, Robert T.; Allen, Mark; Yung, Yuk L. (2005). "Atmosphere of Callisto". Journal of Geophysical Research. 110 (E2): E02003. Bibcode:2005JGRE..110.2003L. doi:10.1029/2004JE002322. ^ Zimmer, C; Khurana, Krishan K.; Kivelson, Margaret G. (2000). 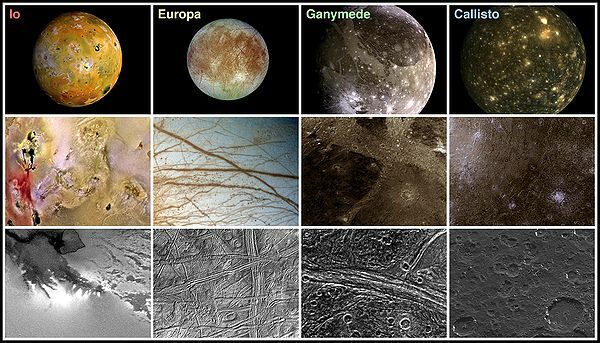 "Subsurface Oceans on Europa and Callisto: Constraints from Galileo Magnetometer Observations" (PDF). Icarus. 147 (2): 329–47. Bibcode:2000Icar..147..329Z. CiteSeerX 10.1.1.366.7700. doi:10.1006/icar.2000.6456. Archived (PDF) from the original on 2009-03-27. ^ Lipps, Jere H.; Delory, Gregory; Pitman, Joseph T.; Rieboldt, Sarah (2004). "Astrobiology of Jupiter's icy moons". Instruments, Methods, and Missions for Astrobiology VIII. Instruments. Instruments, Methods, and Missions for Astrobiology VIII. 5555. p. 78. Bibcode:2004SPIE.5555...78L. doi:10.1117/12.560356. ^ Trautman, Pat; Bethke, Kristen (2003). "Revolutionary Concepts for Human Outer Planet Exploration(HOPE)" (PDF). NASA. Archived from the original (PDF) on 2012-01-19. ^ a b c d Ringwald, Frederick A. (29 February 2000). "SPS 1020 (Introduction to Space Sciences)". California State University, Fresno. Archived from the original on 20 September 2009. Retrieved 5 January 2014. ^ a b c d e Canup, Robert M.; Ward, William R. (2009). "Origin of Europa and the Galilean Satellites". Europa. University of Arizona Press. pp. 59–83. ISBN 978-0-8165-2844-8. ^ Yeomans, Donald K. (2006-07-13). "Planetary Satellite Physical Parameters". JPL Solar System Dynamics. Archived from the original on 2010-01-18. Retrieved 2008-08-23. 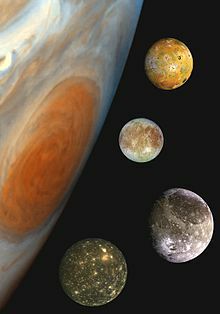 ^ Jupiter is about 750 times brighter than Ganymede and about 2000 times brighter than Callisto.